Discuss how Lucky Stars and Gold Bars personally affected you. What insights did you gain about the World War II era and the political, social, and economic fallout? What compelled Lyle to join the armed forces? Were his motives typical of those of his contemporaries? Why did Lyle write so many letters and what inspired his mother to save them? Did Lyle tend to exaggerate or understate and why? Discuss how his experiences in the army were easier or harder than what he expressed in his letters. Compare and contrast his mind-set to that of his peers. Discuss the combat versus noncombat side of World War II and why only one out of five GIs experienced combat. How do you account for the fact that more American soldiers died from training accidents, disease, and other perils of war than from battlefield wounds? What individuals and events were most influential in Lyle's life and in what ways? 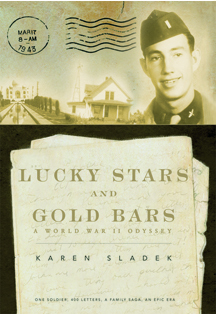 Discuss how Lucky Stars and Gold Bars increased your understanding of historical events and the roles your relatives played in shaping our world today. Who are the real heroes of World War II? What are some of the lessons of WWII?